1. I love, love, love the ::facepalm:: of Plaid Girl here. Combined with the "WTF?" expression on Green Stripe Girl, I really, really wish we could see what they are seeing. What could it be? I'm assuming it's some kind of really embarrassing male display behavior, but I'd love to hear your guesses. 2. Why can't I find shoes like Green Stripe Girl's? Seriously. Those are some darn cute shoes. Im with you on #2 – those are some cute shoes! Sort of…espadrille-y but real shoes. Could someone just please make those for us? thanks! I had a pair of shoes like that in high school. I recently saw something similar on Zappos, only they were brilliant blue. Im trying to remember the brand. #2 was the first thing to cross my mind! I used to have a pair of shoes very much like that, but that was a while ago. Hmmm… must keep my eye out for more.But as to question #1, perhaps theyre disgusted at the constant, childish taunnting that the boys keep using like, Hey, take me to your leader! and I didnt know they allowed aliens from the not-too-distant future in here! and Look, its Mr. Spocks long lost sister Spack just coming back from Home Ec class.Oh come on. Those are some seriously wide, pointy shoulders. Ditto on the eyebrows.Although they are pretty cute dresses. I think theyre embarrassed theyve been sent to this last-minute modeling job…only to be dressed as 10-year-olds. The stylist is now bringing out the props (big stuffed bunnies, hula hoops, etc.) and theyre flummoxed.Awwwwwww-kward. I think it is some sort of unfortunate plumber incident…. http://clarks.zappos.com/n/p/dp/59647263/c/162.html not the same, but a maybe? Love the dresses (without the ruffles) and the shoes. Also, like the pattern size. Thanks for sharing! http://www.blogforbettersewing.com/2010/04/clarks-diamond-heart-shoe-yea-or-nay.html Maybe these shoes would fit the bill. Vintage yet modern…. They are marveling at the antics to which teenaged boys will resort to impress girls in awesome casual sundresses. OMG, Cricket, hillary, Anonymous, and Daphne: All of those shoes are AWESOME. Meanwhile, I kind of like pink plaids shoes, too. I suspect I had a similar expression on my face the other day when a woman stopped in the middle of 4 lanes of traffic in front of me. Why? So she could make a 3-point turn (almost backing into a passing truck) so she could turn around and drive the wrong way into oncoming traffic because she had passed her turn-off. Those are tap shoes !!! Check out http://www.dance4less.com/tap_shoes.htm I think they call them Mary Jane Tap Shoes. Love the vintage .. very cool! 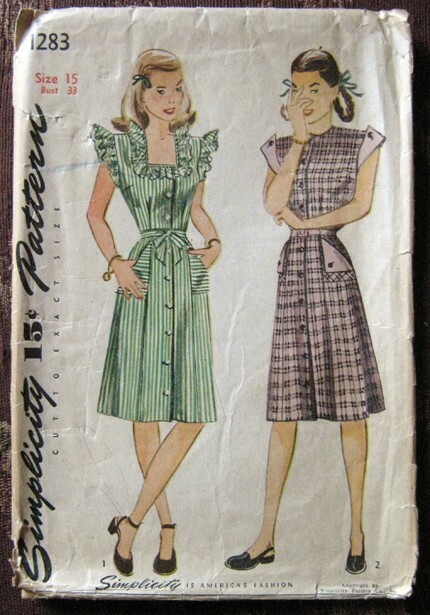 I have lots of similar vintage patterns for sale! Another pair of dance shoes. Not the same but they have a similar “feel”, I think – just look at the criss-cross straps – from my beloved Repetto. The price is forbidding though. hahahaha you are too funny!